The Isle of Skye’s dramatic landscapes are some of the most scenic in Scotland. The best way to experience its epic mountains, waterfalls, and sea cliffs is on a road trip. When most people think of visiting Scotland, Edinburgh and Loch Ness are the first spots that come to mind. While both are nice, I think a road trip up through the Highlands to the Isle of Skye is far better. The scenery on Skye is rugged, breathtaking, and raw. Free to explore at your own pace, you’ll be stopping around each bend of Skye’s notoriously narrow and winding country roads for one incredible photo opportunity after another! 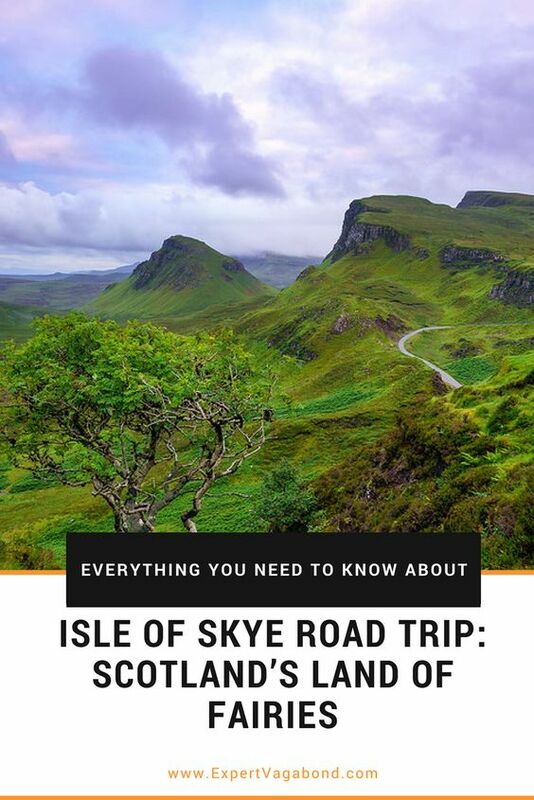 I recently road-tripped around the Isle of Skye in Scotland to experience one of the United Kingdom’s most adventurous and scenic travel destinations for myself. It didn’t disappoint. In this travel guide I’ll help you get the most from an Isle of Skye adventure. Above you’ll find a map of my itinerary for the Isle of Skye. Click on the top left of the map to find separate layers marking the route, points of interest, and other goodies. To hide and show different layers just click on the checkbox next to layer’s name. You can also click icons on the map to see the names of places I mention in this travel guide. “Star” the map to save it to your own Google Maps. If photography and exploring mountain landscapes are your thing, then you’ll love road tripping around the Isle of Skye. The area is steeped in myth and legend — a place where giants and fairies roam. Bloody clan battles were fought here, and ancient castles still stand. You’ll feel like you’ve been transported into an epic fantasy novel. The island is split up into a series of peninsulas. For the purposes of this guide, I’ll cover the Trotternish Peninsula in the East, the Waternish Peninsula to the West, and the Black Cuillin Hills region of the South. Shimmering lochs (lakes) dominate the Waternish Peninsula, while jagged volcanic formations left over from landslides from the Trotternish Ridge. Windswept Red & Black Cuillin mountains rise to meet the clouds in the South. Landscapes on Skye are some of the most impressive in all of Britain. You can drive around the island in half a day without stopping. But because there’s so much to see, I recommend spending at least 2 full days on the Isle of Skye. Plus you should schedule an additional half day to drive up from Fort William, and another half day to get back. Combine your Skye road trip with a few days in the Highlands near Fort William, plus a full day in Edinburgh or Glasgow, and you’ve got yourself a wonderful week-long vacation in Scotland. This is if you don’t plan on any really big hikes or other longer excursions. You’re bound to get some rain whenever you go, but the best season for traveling to the Isle of Skye is summer. There’s a slightly better chance for dry weather between April and mid-June. However, summer is also high-season. The roads will be more crowded, and accommodation is more difficult to find. The island is small. You should be able to fit a 2-day road trip in on a single tank of gas starting from Fort William. However, there are 4 different gas stations on the Isle of Skye just in case you need to fill up. In the main towns, you’ll find plenty of cozy pubs and cafes, with a few dedicated restaurants too. However, most of the towns are spread out from each other. So make sure to stock up on sandwiches and snacks at a local grocery store each morning. Sausage rolls are a big deal in Scotland, and while not exactly healthy, they are perfect for road trips. Mobile internet on the Isle of Skye is pretty bad. In Broadford and Portree you’ll have 3G, but outside the major towns there’s a good chance you won’t have a signal at all. Vodafone and O2 seem to have the best coverage. The most common way to get to the Isle of Skye is to fly into Glasgow, rent a car, and drive up through the highlands from there. It takes 5-6 hours. I flew into Edinburgh, took a train to Glasgow, and then started driving. Fort William is a great place to stop for a night in the highlands to help break up the drive. From Fort William, drive 1 hour West on route A830 to the small fishing town of Mallaig and catch the 30 minute long Skye Ferry to Armadale. From Fort William, head North on routes A82 and A87 to the Skye Bridge, a trip that takes about 1.75 hours non-stop. But you will certainly want to stop with so much to see on the route. Like the incredible Eilean Donan Castle. To mix it up a bit, I recommend trying them both. I started my road trip riding the Mallaig ferry over and finished it driving back on the Skye Bridge. Discover Car Hire searches all the big car rental companies and finds the best price. This is probably the easiest way to rent a car in Scotland. Renting a car on the Isle of Skye itself is a bit more expensive with fewer choices, but possible through Skye Car Hire or HM Hire. Sligachan is a small village located at the base of the Black Cuillin mountains. It’s been a hub for climbers and travelers to Skye since 1830, forming a major crossroads to other parts of the island. The Fairy Pools are a long series of small waterfalls and beautiful crystal blue pools cascading down from the Black Cuillin range. Hiking from the car park takes 30-40 minutes depending on high up you decide to venture. If you want to go for a swim, feel free to jump in! The icy cold water might just take your breath away — but so will the views. A series of 36 imposing peaks huddled together at the southern end of Skye, the Black Cuillins have been a hiking and climbing mecca for 150 years. Dark rocky formations that seemingly rise straight out of the sea. A narrow 12km ridgeline scramble called the Black Cuillin Traverse can be tackled in 2 days with equipment. We decided to take the Bella Jane Ferry from Elgol to the base of the mountains and spent a morning hiking around Loch Coruisk. When the weather is clear, you can hike to the summit of Sgurr na Stri for the best view in the United Kingdom. You can’t visit the Isle of Skye without hiking up to the Old Man of Storr. Large pinnacles of rock that rise from the ground, this location has been used as a backdrop for many movies, including the sci-fi thriller Prometheus. Legends say the rocks are fingers of a dead giant. A muddy trail leads up to the rocks and takes about 45 minutes (one way) from the parking area below. The Old Man is often covered in clouds, but it’s not too far from Portree, so you can always come back later in the day and try again when it’s clear. Definitely, my favorite location on the Isle of Skye, the Quiraing is an other-worldly landscape where huge landslides have created a series of strange cliffs, jagged pinnacles, and plateaus. Trails crisscross the area, and it’s a great spot for hiking. A steep winding road leads up to the top of the plateau, with excellent views of the coast below. On a clear day, you’ll see the Islands of Raasay and Rona too. Take a stroll along the steep cliffs, but be careful, it’s a long way down! Located off the A855 coastal road, there is a viewpoint on the edge of the cliffs here called Kilt Rock. The massive Kilt Rock Cliffs sort of resemble a Scottish kilt, hence the name. Mealt Falls is a long waterfall that cascades off the cliffs into the ocean below. You need to lean your head out to get a good photo (or bring a drone!). A strange and magical place, the Fairy Glen is hidden away off the main road near the village of Uig. It’s a miniature green valley with odd, perfectly conical hills, gnarled dwarf forests, and packs of grazing sheep. Whoever named this place couldn’t have picked a better one. Hiking the maze of trails, you’ll find a new wonder around every bend. Like white stones arranged in concentric circles on the valley floor. A lone rock tower rises above it all, with excellent views of the enchanted landscape below. If fairies do exist, this is their kingdom for sure! Located on the most Westerly point of Skye, Neist Point is a finger of land stretching out into the sea with a powerful 480,000 candle powered lighthouse on the tip. Massive cliffs ring the coast here, and it’s a wonderful photography spot, especially around sunset. A walking path takes you all the way to the lighthouse if you want some exercise. It gets very windy on these cliffs, and there have been cases of tourists falling to their deaths. So be very careful near the edges. A magnificent castle perched on the edge of a lock, Dunvegan has been the ancestral home to the Chiefs of Clan MacLeod for over 800 years. Still owned by the MacLeods, it’s pretty cool that you can walk through their home, and it’s full of old heirlooms and paintings. One of the treasures on display is the mystical Fairy Flag, a sacred banner with miraculous powers. Supposedly given to the clan by the queen of fairies, legend says when unfurled during battle, the MacLeods would always defeat their enemies. The Talisker Distillery has been on the island since 1831. Scotland is famous for its whisky around the world. The flavor of a whisky changes depending on where in Scotland it was distilled and whiskeys like Talisker brewed on the islands have a strong, peaty taste. The Isle of Skye is a small island, so it doesn’t have a ton of accommodation options. During the summer high season, hotels and B&B’s can all be sold out. It’s very important to book your accommodation in advance! More like a guest-house than a hostel. Clean, close to everything in town, and comfortable. Basic, clean, and friendly hostel with a great sea view from the common area. Perfect for hikers/walkers. Friendly staff, nice hot shower, great location in Portree. Nice place to base yourself on Isle of Skye. Comfortable B&B close to supermarket and restaurants. Nice views from property. Here is a good list of official campsites on the Isle of Skye. Wild camping is allowed, as long as you follow Scotland’s Outdoor Access Code. There are a few “bothys” too — wilderness cabins free for hikers to use. We spent one-night camping on the coast at Camas Malag, and another night at the Rubha Hunish bothy on the edge of a massive coastal cliff. Accompanying me on my road trip around the Isle of Skye was Scott from Wilderness Scotland. Working as a guide in the Highlands for years, he showed some of his favorite spots. 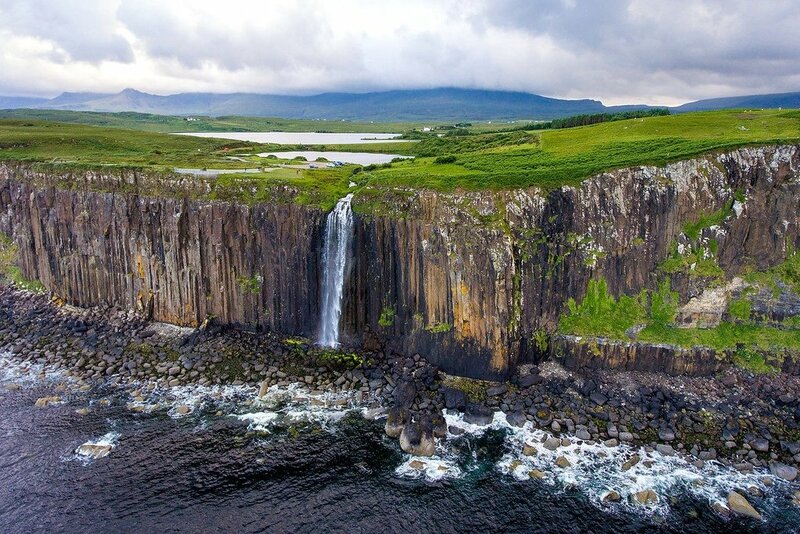 If you’re looking for a bit of adventure during your trip, check out their Isle of Skye tours. Whether you’re into short walks or long-distance hikes, Skye has it all. The Skye Trail is a 128km route that covers incredible mountain & coastal scenery. It takes about 7 days to complete. Road cycling tours are very popular on Skye due to the island’s paved winding roads and amazing scenery. A support vehicle can take your gear to the next town where it’s waiting when you arrive to spend the night. Google’s typical driving times are not what they seem, due to all the scenic stops, it can take 2-3 times as long as you think. The weather changes quickly on the Isle of Skye. So just because the famous “Old Man Of Storr” happens to be covered in clouds at 9 am doesn’t mean that will be the case an hour or two later. 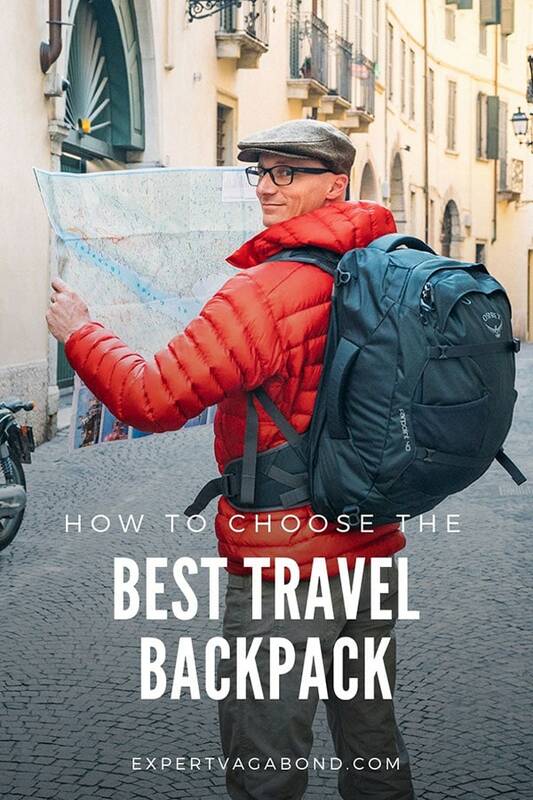 It’s wise to keep some waterproof travel gear (jacket, pants) packed with you at all times when you’re outside on a hike or visiting an attraction. Roads here are narrow, often without shoulders, and most back roads are single lane. If you’re not used to Scotland driving itinerary, it can be nerve-wracking. Single land roads have special passing areas every 400 meters or so. Proper etiquette is the car closest to the turn-off pulls over first. The Isle of Skye is a small island, so accommodation must be booked well in advance, espcially in the high season of summer. Have any questions about traveling the Isle of Skye? What about other suggestions? Drop me a message in the comments below! Thank you for the beautiful description. 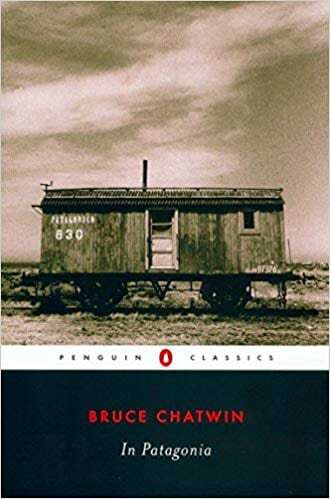 It gives a good insight of the place. Iam planning to visit Isle of skye with my friends in the month of may. We will be driving from Inverness to isle of Skye. 1. Which route to take from Inverness to Isle of Skye?? 2. The best time to visit fairy pools in the day?? Heading to Skye with my mom for a trip she has dreamt about her whole life, taking train from Glasgow to fort William then Jacobite train, then ferry to skye for a week I rented a car, will driving really be as bad as it sounds?? Driving in Scotland isn’t so bad after a bit of practice. The roads are just narrow, with no real “breakdown” lane like there is in the United States. So there’s less room for error. I’m planning on going to scotland by June 11. flying from London to Glasgow. We plan to stay 8nights. places we want to go to are: Isle of Mull, Isle of Skye, Inverness for day trip to Orkney and fly to Dublin from Inverness. We plan to rent a car but how do you go to Mull and Skye with our rental? Please advise. Thanks! That’s some insanely epic landscape there. Reminds me of Iceland. How’s the food? Is there beer in those parts? Back in the 1960’s, my great aunt and her husband owned the only petrol station on the Isle of Skye. We’ve always wanted to visit, but our one trip to Scotland back in 1993 didn’t allow enough time. It’s definitely on our list of places to return to. Hi there, great post! Loving all of that green freshness! Great Post, Matthew! Thanks for sharing. Loved how you share your travel story! And, the pictures are simply breathtaking. Awesome blog! Glad I found you guys today! Cheers and enjoy the rest of the week! Please stop reiterating this nonsense about the Fairy Glen. The concentric white circles of which you speak are tourist vandalism. The “legend” of the fairies has grown up in the last 10 years encouraging idiots to leave “votive offerings” – i.e. rubbish – for others to pick up. Skye is a wonderful place for people to visit. It doesn’t need new “cairns” being constructed, or piles of litter being left behind, causing damage to a fragile environment. Come, look, enjoy, linger, be amazed but leave no trace of your having been here. What nonsense? It’s a strange & magical landscape, as I said. However I agree, if you visit the Isle of Skye, please respect the environment and leave no trace. It was tourists that named it “The Gairy Glen’. It’s proper name is “An Cnocan” (The hills). You must remember Gàidhlig is the native language of Skye, so any place that has “fairy” or “coral” in its name is a tourist invention. Beautiful scenery, great pics Matthew !! So funny the sheep looking at the drone, haha. They were mesmerized by it! The Isle of Skye is a beautiful place for photography. What a wonderful write-up! The photos of Skye are gorgeous. Makes me want to go there right this minute. Thanks Mark! Glad you enjoyed them. Last year I was in Isle of Skye, and I have to say that even two nights might fall short. Such a beautiful island, it was definitely the highlight of our whole Scotland trip! Hi, I am planning a trip to Scotland and I am glad I found so much information on your website. Love to hear that Rolf, glad I could help. Good luck on your journey to Skye! Thanks for the idea Matt. I loved my last two trips to Scotland, and need to go back. 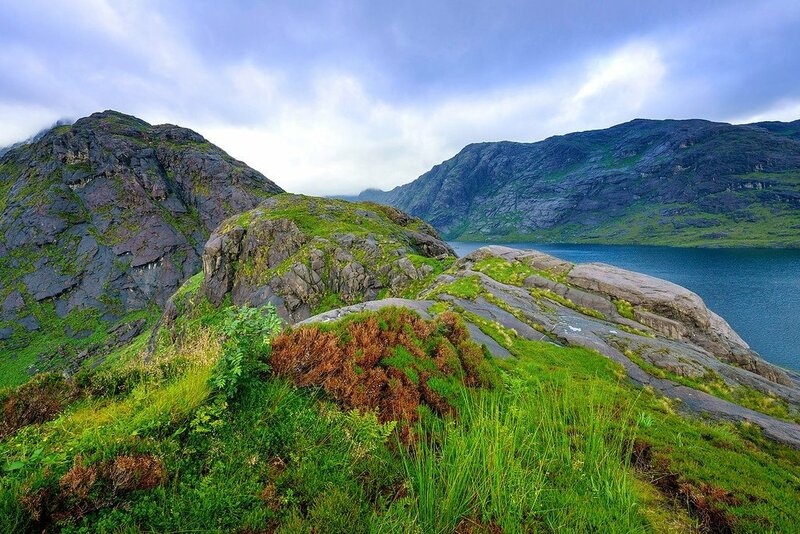 I haven’t spent near enough time exploring the Highlands, and still need to venture over to Ireland. Your post, and those photos, bumped that trip up my list a little. Thanks for the motivation! Awesome Bryan! You’ll love the Isle of Skye. I wish I’d visited sooner. i like the place, very awesome pictures you’ve got there! It is very pristine for me and looks very magical, or maybe I’m just thinking too much of leprechauns with all the green I’ve just seen. Gorgeous landscapes, especially the Quiraing. Great video, love the music! 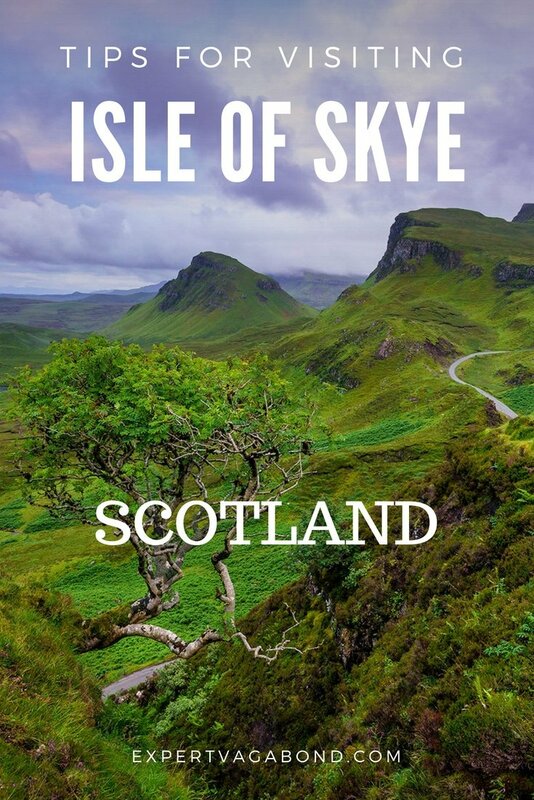 Really enjoyed this guide to the Isle of Skye but more importantly, I absolutely loved the video. As I said over on YT, this is your best video yet. Thanks Ryan! Haha. Drone racing for sure. Great Photos and awesome video. Isle of Skye looks like an amazing place to get lost in. I’ve been to Isle of Arran, but this looks like another place I might have to visit the next time I go to Scotland. Yeah I was learning about some of the other islands in the area too. Still so much of Scotland to explore! Going to Scotland in 2 weeks and I will be camping in Skye for 3 days! Can’t wait! Just seeing your video at the end gives me butterflies in the stomach! Sweet Kassie! I hope when you do visit the Isle of Skye, this post helps out. The Isle of Skye is one of my most favorite places in Europe! Gorgeous photos here. I can’t wait to be going back myself in September! Thanks Amanda. So many scenic locations for great photography on Skye. Hi Christina! You should definitely visit Skye one day! My guess is your sausage rolls are far more tasty than the store-bought ones, but I’ll have to make a few for myself and give them a try! I’ve never fallen in love with a place quite like Scotland. After living there for a few years when I was a child – and later on when my Dad moved back for a while – there’s always a magic about the place. If you can’t make it to Skye, literally anywhere that isn’t Glasgow is an amazing trip to take. I’d highly recommend the west highland way, too! We saw a bunch of hikers on the West Highland Way on the drive up. I’d love to try that hike one day. I spent two summers in the Scottish Highlands and I agree that the weather is bad. I don’t know how people go on cycle tours there. The scenery is amazing though, especially around Glencoe and Fort William. I’ve never made it to Isle of Skye but I did go to the neighbouring Isle of Eigg and loved it. Glencoe & Fort William are wonderful places to spend a few days for sure. I’ve got another article about the Highlands going up in a few weeks. Tons of great hiking! As long as you don’t mind the occasional rain shower.